I've got a thing about colours at the mo. and over on "Show us Your Stuff" they have Moodboard challenge going on this month - green being their chosen colour.. 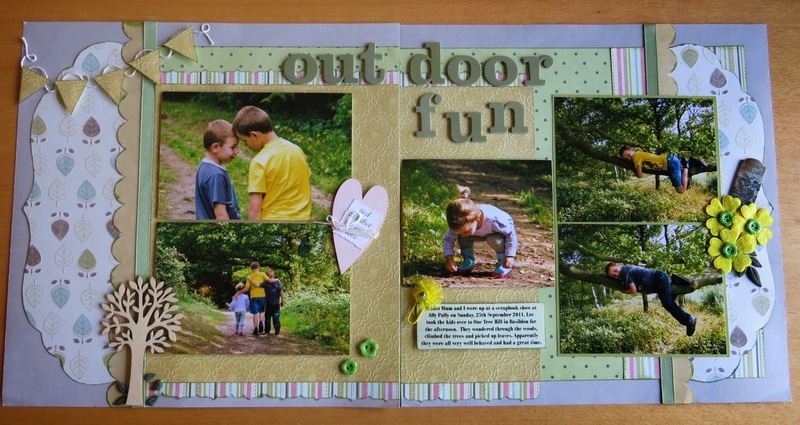 I'm not a huge fan of the colour green, but I found these photos of the kids fitted really well and I'm quite pleased with my resulting double page layout. My required "handmade" embelli is the bunting in the top left hand corner and the pink heart in the centre tied with string. Please feel free to click on the actual photo below to take a closer look. Perfect photos and I very impressed with the double layout you've put together! I always love a double ! Thanks for playing at SUYS! Lovely layout! (I too, am always impressed with a double.) Love the cute little bunting, and great pics of your kids too! Thanks for playing along at SUYS. I'm married to a wonderful guy called Lee and we have two gorgeous boys - Alexander & Nicholas and a beautiful daughter Cassandra. I run my own secretarial business, I've recently completed a degree - BSc in Criminology and Psychological Studies and my TA level 3. This year I'm planning to gain my HLTA qualification and Sept 2019 sees me start training to become a fantastic teacher! I like to keep busy and one of my favourite hobbies is scrapbooking..